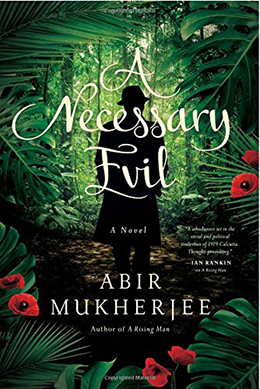 Abir Mukherjee’s second novel, A Necessary Evil, capitalizes on all the best traits that made his debut, A Rising Man, such a success: relatable characters, rich period detail, accomplished prose, and a fascinating central crime. With A Necessary Evil, Mukherjee has secured his ranking as one of today’s best writers of historical crime fiction. A Necessary Evil once again transports readers back to Raj-era India. Abir Mukherjee wastes no time introducing the crime that will propel the novel’s plot. Just pages into the book, Captain Sam Wyndham and Sergeant “Surrender-Not” Banerjee are traveling with the current heir to the throne when an assassination attempt is made against the royal caravan – one that ultimately succeeds in killing the crown prince. With such a high-profile crime, it makes sense that the authorities want the case closed as quickly as possible, but in typical Wyndham style, Sam refuses to believe the “easy” answers and requests permission to travel to Sambalpore, the city from which the Maharaja oversees his kingdom. The delicate nature of British/Indian relations requires that “Surrender-Not” take the lead on this expedition, which is a delight to readers, like myself, who find the native Banerjee the most fascinating character in the series. As with most historical series, Mukherjee teaches his readers along the way. Having those lessons skillfully woven into the plot is a delicate art and this is a writer with a sure and steady hand. Readers will hardly realize they have gained new knowledge until after closing the book and reflecting back on what they have learned about the structure of the Maharaja’s harem, the rules of succession to the Indian throne, and the dangers of tiger hunts – to just scratch the surface of the many period detail included within this novel. Along with trying to determine who assassinated the Yuvraj, Sam Wyndham continues to struggle in his personal life. He remains haunted by his past to such an extent that his opium addiction is escalating. Even as he continues to feel the shame of addiction, Sambalpore provides a new, and more dangerous form of the opium Sam so desperately craves. Meanwhile, things on the romance-front also remain rocky. The woman who caught Sam’s eye in A Rising Man, Annie Grant, once again plays a role in this sequel, but still Sam cannot seem to get out of his own way – he boosts his bravado to counter-act his insecurities and jealousy rules his every action. It is no surprise that Annie sees right through him and yet Sam, and readers, cling to hope for some type of relationship. Abir Mukherjee casts a spell with his writing, taking readers back to an unfamiliar time and making us better people in the process. A third book in the series, Smoke and Ashes, is already available in the UK and will reach US shores very shortly. If you are not currently reading this historical series, now is the time to begin that journey to the past.